The new and powerful GeoMax Zone laser rotators portfolio offers the right construction tools for all trades and applications. Regardless if you’re just starting in the industry dealing with the fundamentals or you’re a seasoned professional handling complicated applications, GeoMax laser rotators are ready to work wherever you are. Fully-automatic grade specifically designed for construction workers who need the dependability and accuracy of a fully professional grade laser on a daily basis. Insert the percent of grade needed in either single grade or duel grade and the Zone60 DG will self level to that slope. Self-levelling horizontal, vertical, digital slope in dual axis (full-automatic). With a straightforward user interface on both the laser and the RF remote, the craftsman is always in full control. Comes with 3-year full-cover warranty. Add range and precision to your work. 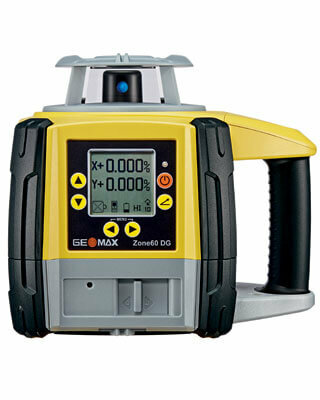 Increase your range in your work environment with the GeoMax remotes, a hands-off operation with all functionalities and enhance distances and all light conditions with the GeoMax receivers. Dependable, entry level performance receiver with all basic features. Top performance. Professional format with a detailed, multi-channel analog, dual display, supported by adjustable LED and audio signals. Build-in flash suppression. Best digital display technology, packed into a professional and robust housing. Fully featured for a top performance with precise results. Dual display, supported by adjustable LED and audio signals. Build-in flash suppression.